Why did you subtitle it Daichi no Kiteki (Japanese meaning Train Whistle of the Wide World)? That comes from Director Iwamoto’s name. Abbreviate “Daichi no Kiteki”, and you get “Daiki”. We settled on the “Train Whistle” part very quickly. Of course it refers to the train’s whistle, and then this game has one of Zelda’s characteristic sound items in it, too. pan flute 11 this time. 11 Pan flute – Also called “pan pipes”, they are said to be the world’s oldest instrument. Made of grasses, bamboo or wood, they are found all over the world. However, at present, the ones from Romania and the Andes are particularly famous. Since that’s the case, we considered using “Pan Flute of the (something)” as a subtitle, but it would have been a bit long. Besides, you can use the pan flute, but it isn’t a main item. Then, if you say “train”, “train whistle” follows automatically, and a pan flute is also a “whistle”, so we thought it might work for both. That’s why we decided to use “Train Whistle”, but we weren’t sure what to do about the “something” in “Train Whistle of the (something)”. That one gave us quite a headache. Then, “Spirit Tracks” was decided as the subtitle for the North American and European editions, before we’d found ours. “Spirit” means “soul”, so we took that and tried “Train Whistle of the Soul”. But that made it sound kind of creepy, possibly haunted. (laughs) We were making a pleasant game about running a train across wide-open spaces, and we just didn’t think it fit. Finally, we asked for suggestions from the staff and wrote them all on a white board, and from those suggestions, we narrowed it down to “Train Whistle of the Wide World”. What finally decided it was the sound. When I said, “Train Whistle of the Wide World”, it just rolled off the tongue. 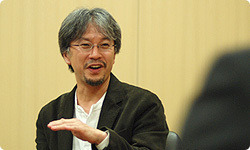 Then, after we’d decided on “Train Whistle of the Wide World” amongst ourselves, we sent an e-mail to Miyamoto-san, asking him what he thought of it. And he just answered, “I think it’s good”. “I think it’s good” is a pretty short answer. What did you think when you got that back? When something’s no good, there are always lots of reasons why it’s no good, but when it is good, you don’t really need reasons, you know. Still, not having him say anything must have made you a bit nervous. It did that. 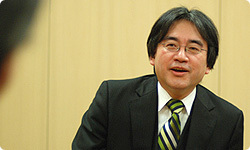 (laughs) Miyamoto-san was probably busy with New Super Mario Bros. Wii12. 12 New Super Mario Bros. Wii – An action game for Wii released in November 2009. But anyway, that’s how we decided on “Train Whistle of the Wide World”, and we took to it very quickly. It never felt strange to us. We got used to it, yes. And that’s not all; the pan flute is called “Whistle of the Wide World”, too (in the UK version it is called “Spirit Pipes”). I see. “Whistle of the Wide World”. Not only that, the areas where action takes place are all called “Wide World of the Something”, too, so the place where the ocean is is called “Wide World of the Ocean” (in the UK version it is called “Ocean Land”). “Wide World of the Ocean”…? They told us that “Wide World of the Ocean” was weird, no matter how you look at it, but we wanted all the names to match. By the way, about the “Whistle of the Wide World” pan flute… Why is it that every “Zelda” game has some sort of sound item in it? I’ve wondered about it for years. Is it because the sound staff is in on making the puzzles, too? There isn’t a sound item in every game. There wasn’t one in the last one. Oh, that’s right. There was one in “Ocarina” and in “Wind Waker”, but I suppose there isn’t always something. As you’d expect, when the sound team takes a firm line and tells us, “We want to try doing this this time”, we often do use that as our jumping-off point. So I think that they do feel as though, since it’s “Zelda”, we should use some sort of sound item. In this case, the pan flute was brought up fairly early in the game. Then, too, the microphone input capabilities are featured pretty prominently in this game, so the two concepts meshed together neatly. There are a lot of places that use the mic, aren’t there? Yes. But if we worked the players too hard, they’d run out of breath. You don’t need to blow hard at all, do you? No. Then, the sound team worked very hard this time, and there are all sorts of whistle sounds for the players to enjoy. What do you mean, all sorts of whistle sounds? Well, this game also supports Contact Mode. It’s made so that you can collect parts for the train. In the previous game, we had players collect parts for the ship. You’d wind up with parts you didn’t need, and you could exchange those for parts that you hadn’t managed to get. It’s a little different this time, though. There are “treasures”, and you can collect many different types. Once you’ve accumulated a set number of a certain sort of treasure, you can exchange those for your train part. Not only that, the things you collect vary from player to player. The treasures show up randomly. It’s different for every person. By using the Contact Mode of DS, or “passing transmissions”, they can collect more effectively. That’s it. This train is split into four sections: the train itself, the gun battery, and then the passenger cars and freight cars. You can customise all of them. There are all sorts of different variations to play around with, and one of them is pretty incredible. Yes it does. The normal train whistle is the usual, low-pitched one, but they’ll get to hear some very interesting whistles, too. Well, you can’t really call it a train any more, so it doesn’t matter if it doesn’t sound like a whistle. (laughs) Anyway, that’s how much fun you can have with it, so we definitely want them to use Contact Mode.